Vintage Dancer | 1960s Fashion | 1960s Fashion: What Did Women Wear? Mid 1960s fashion for women. Pin this! Women’s 1960s fashion was extreme style and attitude from the start of the decade to the end. In the early years, the fashion idol was Jackie Kennedy with her perfectly white pearls and tailored suit dresses. By the middle of the decade, supermodel Twiggy had women freeing their minds and bodies into clothing that didn’t require any extra thought or effort. From modest to “there is no such thing as too short,” 1960s fashion was in many ways like the 1920s flapper revolution. But it didn’t happen overnight. Jackie Kennedy’s style was clean, simple, well fitted, with perfectly matched accessories. She wore dresses without collars and jackets that buttoned only with one large top button. She wore sensible low heel shoes (although many women still preferred high heels). She was the last woman to wear hats, a pillbox hat, as a necessary fashion. Jackie O’ put a lot of care into her look, and women in the USA and abroad copied her style with enthusiasm. Sadly, after her husband’s assassination, Jackie was no longer in the public eye. Women had to find a new 1960s fashion idol to be inspired by. Brigitte Bardot was that woman. She was Jackie’s opposite. Jackie was put together, simple and modest. Brigitte was tacky, cheap, bold, and even silly. Her 1959 pink gingham wedding dress with white lace trim was so unexpected that gingham and lace quickly became the new trend. It was the whole idea of a return to youth that drove most of the fashion in the 1960s. Oversize collars, bows, and delicate trim miniaturized women and made them appear smaller. Shapeless mini dresses de-emphasized a woman’s natural form. Kitten heel pumps, Mary Jane strap shoes and flat sneakers were all childhood favorites returned to the the ’60s youth quake culture. It was no coincidence that a youth driven culture had a lot to do with half the American population being under 25 and with European countries having a similarly large youth population, too. After growing up in the ‘50s as “little adults” the youth embraced their fond early childhood memories and fashions. By children’s fashion, we mean babies and toddlers. The “babydoll” look was incorporated into dress, hair and makeup. 60s mini dresses- Shop them here. 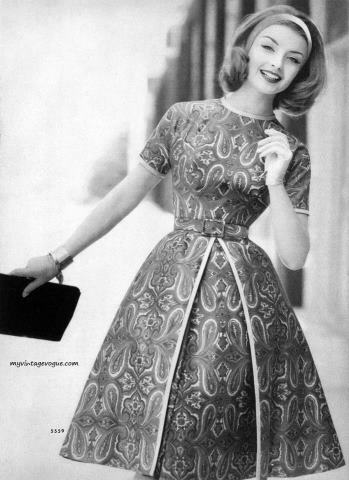 The full skirt and tight bodice of the ‘50s dress continued in the early ’60s, with a slightly above or at the knee hemline. The style didn’t last long before the ‘50s pencil dress loosened up and turned into the shapeless “shift dress” in 1963. How short a woman’s dress was became a sign of how confident she was (not necessarily that she had great legs). Hem length was directly proportional to how women felt about their own sexual liberation. Short skirts were not meant to attract men for the sake of sexual interest, but instead were a way to attract attention so that a WOMAN could be the one to decide if his attention was wanted. Sexual power through fashion. The jumper dress was a Mary Quant invention that captured the youthful, playful, side of 1960s fashion. That style immediately made a 20-year-old look 10, a welcome change from the ’50s mature fashion. Big bows, large round collars, pastels, and polka dots were all dress details that made women look like little girls’ dolls. The more innocent the better. Colors and prints were at first inspired by the pop art and modern art movements. Checkerboard, stripes and polka dots, colorblock, and Campbells soup cans were all placed on short shift dresses. Being over the top was never too much. Eventually “pop” settled down into soft pastels, pique fabrics and gingham checks made for a gentler “girly” appeal. There was also a trend of earth tone colors, especially as the decade moved toward the hippie movement. Moss green, earthy browns, mustard yellow, burnt orange were common colors year round. See more examples of vintage 1960s dresses here. 1960s Tops. Loose Fit, Big Collars. Tops, shirts, blouses, and sweaters all took direction from casual clothing in the 1950s. The primary change was that shirts and sweaters now fit straight on the body with no emphasis on the bust or waist. Tops could also be worn untucked, gasp! They hung out over pants and skirts and grew longer as the decade advanced. Necklines also grew higher, back to the modest look of the 1930s. Big roll collars, round peterpan collars (often in contrasting white), big bows, and pointed shirt collars called attention to a thin neck and short hair. Shop 1960s tops and shirts here. Shirts with patterns were in style, too. Again, bright colors and big prints made colorful statements when paired with a solid color matching bottom. This isn’t to say solid colors were out. Knitted tops and sweaters were more often than not a single solid pullover or cardigan style. The ’60s knitwear design favored texture: thick textured cable knits and some rib knits. The exception was the mod stylist who embraced a very snug fitting knot crop top or long sleeve turtle neck shirt (usually black or white). Read more about 1960s knitwear sweaters and shop 1960s sweaters and cardigans. For winter wear, a good wool coat was still necessary. The coats narrowed down and shorten up to fit over new, thinner, clothes. Round collars with big buttons, flap pockets, geometric prints and maybe a belt kept them looking cute and fun. They came down to just above the knee so that long lean legs would continue to be the focal point. Shop 1960s coats and jackets. 1960s style coats and jackets. Shop them here. 1960s skirts came in at the knee lengths with classic box pleats, straight pencil, a-line, and full circle (or half circle) shapes. Solid colors, as well as big patterns, were in style. The notorious mini skirt was made in any of these classic styles but now came up to mid thigh! Plaids, pleats, corduroy, and heavy knits were perfect for minis. 1960s style skirts. Shop them here. Jax pants were an updated capri pant, lined, and without a waist band. They too were worn with crop tops since the lack of belt loops made it impossible for blouses to stay tucked in. It was a 1960s fashion freedom to not have to worry about bunching shirts. Less fuss, more fun was the way of the sixties. The stretchy stirrup pant took advantage of a new kind of knit fabric. Easy to sew and wear, the elastic stirrup over the foot kept pants smooth and straight. It didn’t matter that the stirrup was visible. When ankle boots came into fashion, suddenly visible stirrups were taboo. Boots must be worn! All pants came down to just above the ankle until the late ’60s when longer pants became the new trend. They also still zipped up the back or side (zipping up the front was for men). Denim jeans followed the fit and style of slim pants: high waist, tapered leg, ankle crop, and in many more colors than just blue. Starting in 1961, bell bottom pants slowly replaced tight fitting capris and rolled up dungarees. The sexiness was in the short crop top, worn with high waisted bell bottoms. By 1967, they were associated with the hippie movement. As shocking as a mini skirt was to society, there was an equal confusion over the new pantsuit. It was a look directly copied from men’s suits but tailored down to feminine proportions. Some work offices and establishments forbade women to wear pantsuits. There was a confusion over whether they were an insult to femininity or empowerment for women (and that it disrespected men). While 1960s fashion magazines debated, women flocked to the stores to buy them. They were already wearing casual pants everywhere else, wearing dressy pants seemed only natural. 1960s Shoes styles. Vintage shoes (l) new 1960s style shoes(r) Learn more. With legs now fully exposed by short hemlines and the youthful girl look on trend, shoes took a drastic turn from high fashion with high heels to street fashion with low to no heels. Flats were in. Cheap was in. Color was in. Thanks to new materials, PVC (Vinyl), shoes could be mass produced for cheap and come in a lot of bright colors to match dresses (which they did. Always match shoes to a dress or other accessories). The low heel made them easy to walk in and live life in. All the designs of the earlier decades– loafers, Mary Janes, T-straps, monk straps, saddle shoes, and Oxfords were designed into a flat shoe for the ’60s. Even boots had flat heels. Thanks to PVC and an interest in all things futuristic looking, tall boots in white or silver became the new black. Everyone wore them. They looked great with short dresses and skirts. The more modest folks wore boots and half boots in brown. Again leather was out and shiny plastic looks were in. Sandals, like flip-flops, made their beachside debut in the 1960s. Women wore them with everything casual. Birkenstock sandals became icons of the hippies. Most 60ssandals were made of shiny plastics, bright colors, thin straps with squat flat heels. Plain white sneakers replaced saddle shoes for school-age kids. They had to be plain white and perfectly clean. They were worn with socks or with stockings a shade or two darker than natural skin, which made them appear even whiter. Read more about ALL the 1960s shoe styles. Colored tights were also popular- white, black, purple, fishnet, herringbone or lace. Tights covered up ugly knees and didn’t cause garter gaps like sheer stockings did. Once pantyhose were perfected they were the savior of women’s legs anywhere. They camouflaged hair, bumps, bruises, and wide kneecaps. Even skin tone tights were thick and dark. To go bare legged in the ’60s was still too immodest. Ironic? Shop colorful tights inspired by the 1960s. Colorful 1960s clothing needed equally colorful jewelry. In the early years, traditional jewelry continued to favor textured gold, white pastel, and colored pearls. These pretty and safe designs complimented the feminine 1950s style clothing. The new youth with their obsession with fake plastics, vinyl, and bold colors favored jewelry inspired by Pop Art. Geometric shapes made their way onto over-sized dangling earrings. Large chunky bangles or stacks of thin bracelets jingled up and down bare arms. Novelty shapes were still popular, but they embraced brighter colors and more comical themes. The same went for flowers, now made from plastic resins. They were cheerful pastel or primary colored clusters hanging from necklaces, earrings and bracelets. Learn more about 1960s jewelry styles here. Shop 1960s inspired jewelry. 1960s Style Jewelry in Bold Colors. Perfect accessories for your mod outfit. Shop them here. Without a hat to call attention to a woman’s head, hairstyles became a new focus for women. The bouffant look teased hair to new heights, literally. Guiche curls kissed her cheeks (made possible by a bit of nail polish to keep them pointed to a crisp.) All that volume made faces appear smaller and more doll-like. Hair length rose from shoulder to chin and cropped above the ears as the decade progressed, only to come crashing down again in the ’70s. The graveyard look was in. Pale white skin, white lips, bold black eyeliner and dark smokey eyeshadow. It was a stark contrast to the girly look of clothing until the mid ’60s when a layer of childness was added. Eyes were exaggerated with extra long lashes, shimmer eyeshadow, arched brows, light spot blush, and lips turned to a baby pink pout. The combination, looking back, was a scene from a child-meets-ax-murderer horror movie. You can get reproduction 60s makeup at Besame. The late ’60s saw a movement of anti-fashion, a political statement, that grew so popular it became a main stream fashion style. The look started with faded denim jeans, basic and boring, anti-fashion. The flower child decoration of patches, embroidery, painting and studding came later in the 1970s. The ‘60s hippie was simpler, more earthy. To go with jeans, a hippie would wear a strapless undershirt. White at first, then later dyed in earth tone colors so that it didn’t look like underwear. Tie dye followed after that. The more colors the better. The gaudier the colors, the better! Anti-fashion meant anti anyone who has any opinion about what “works” and “doesn’t work” in fashion. Forest green with brown suede, sunshine yellow with denim blue were signature colors of the hippie ’60s. Colors were not the only thing to be exaggerated. Clothes were of extreme proportions. Hats were big and floppy, vests hung down to the knee and coats to the floor. A return to folk arts meant beading was on clothes, not just jewelry. Ethnic details covered anything and everything. There were no rules to hippie fashion. Mix and match and develop your own beat was the 1960s hippie fashion mantra. The 1970s continued the hippie trend into mainstream fashion. The youth-oriented looks turned to the complete opposite– granny style. Romanticized granny clothes from several generations ago, like pioneer women, returned fashion back to long dresses and sleeves, ruffles, lace trim, small cotton prints, and long hair (worn down, not up, this time.) The age of the mini skirt “grew up” and turned into adults, not like their parents, but like generations before, which seemed to have the simple life that hippies idolized. Now that you know about women’s fashion in the 1960s, why not dress like it? Many of today’s contemporary “modern” clothing is inspired by mid ’60s fashions. A-line mini skirts, contrast collar shift dresses, textured tights, low heel flats and tall boots, swing coats and floppy hats. They all have roots in the sixties. The current trend for retro sunglasses is also heavily inspired by the 60s. To create a 1960s inspired wardrobe, start with a dress (or pants and top) and add a pair of stockings or knee socks, flat or boot shoes, jewelry and a coat for winter. We have links to all the great 1960s inspired clothing online to make your shopping mission easier. To learn more about 1960s fashion read up here. If you prefer to sew your own clothing, we have links to patterns available here. Need more help with your 60s outfit? Just ask us anytime! What do you like about 1960s fashion? Leave a comment or ask a question below.